Terminator 6 is currently filming in Komárom, Hungary and we now have a short behind-the-scenes clip that features a helicopter taking off, possibly to escape. Production on the sixth installment in the franchise was previously shooting in Spain, which is where the car chase scene was filmed that leaked online a few weeks back. Information about Terminator 6 has been scarce, but it will erase everything that came after Terminator 2: Judgement Day. James Cameron is back on board producing, so fans of the franchise are hoping to see a long awaited return to form for the franchise. The new Terminator 6 leaked set video takes place in the evening and we see a helicopter taking off and then pulling a sharp turn. With the way that the helicopter is moving, it looks like it could be an escape scene. There are 3 people seen in the chopper, but it's unclear who it is, though there has been some speculation that the pilot is Linda Hamilton's Sara Connor and that the passenger is Mackenzie Davis' character. There is also a third unidentified body in the shot as well. Tim Miller is directing Terminator 6 and he and James Cameron assembled a writing crew to help make the new installment something that can stand alone, while also fitting into the original trilogy that Cameron had in mind. As previously noted, the movie will ignore the events of everything post-Terminator 2, which has some fans excited and some a little uneasy. Cameron has called the other films a "bad dream" and explains that they could take place in an alternate universe compared to what they're trying to accomplish with Terminator 6. Since Terminator 6 is ignoring the last handful of movies, Linda Hamilton is able to come back as Sara Connor after 2003's Terminator 3: Rise of the Machines revealed that she was dead. Hamilton coming back to the franchise along with Arnold Schwarzenegger is a big deal for fans who have been waiting to see them together again on the big screen for nearly 30 years. Pictures of Hamilton from the set leaked online as soon as production started on the sequel, and fans have been waiting for more ever since. After filming wraps in Hungary, it is believed that the production of Terminator 6 will head back the United States to finish everything up. The sixth installment, and direct sequel to Terminator 2, will open in theaters on November 22nd, 2019. The original release date was in July of 2019, but the studio decided to push it back for reasons that are not clear. 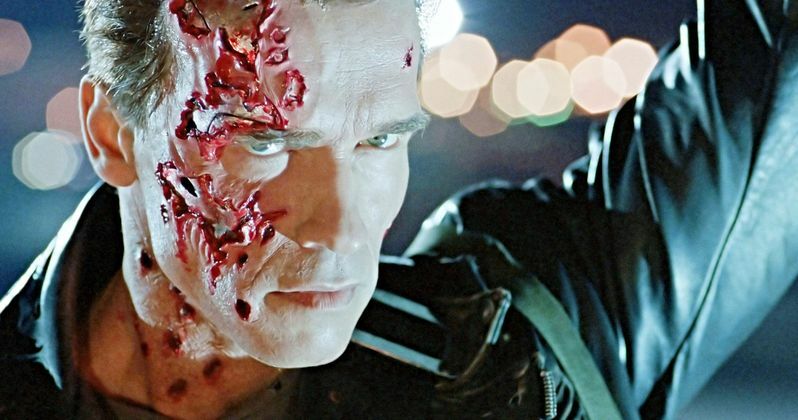 With James Cameron back with the beloved franchise and Tim Miller helming the project, hopes are high that Terminator 6 will be what fans have been waiting for. Will it live up to the hype? We'll just have to wait and see. While we wait, you can check out the new helicopter scene from Terminator 6, which arrives from Paramount Pictures next year.